The problems faced by paraffin stove users around the world are legion. Most of the devices in use are known to have a tendency to explode, or to make a loud *BANG* every now and then. They are notorious for their emission of carbon monoxide (CO) due to incomplete combustion of the fuel. Many thousands of people die each year in fires caused by paraffin and paraffin stoves. People continue to use them in large numbers because of a lack of alternatives at a suitable cost. Thus it was agreed that this technology will be in the public domain insofar as the basic unit is concerned. It was agreed between the FS Technikon and the developer that the technology resulting from the project was, upon reflection, so fundamental an improvement that it should be immediately spread around the world as quickly as possible. For that reason you will find (eventually) on this website complete plans for making and operating a Free State Paraffin (FSP) stove. In order to give credit where it is due, the brief history of the FSP stove is in order. The REDI stove was developed in Switzerland by a group of retired UN engineers with the same objective - to create a safe, inexpensive stove for manufacture and use by poor people (who dominate the paraffin stove market). The REDI stove had several innovations, the most important being that the fuel was not kept inside the stove, but fed from an elevated tank. The stove is otherwise a 'roarer' type of stove with a paraffin gas spraying out of a jet, the resulting flame heating a tube or tubes that create more gas from the liquid fuel. In order to keep the fuel flowing smoothly and in a regulated manner into the pre-heater and thence to the jet, a throttling jet was placed in series with the hose and burner. That jet is smaller than the gas jet. When the paraffin boils and sprays upwards, it also pushes the fuel backwards through the throttling jet which causes a pulsing of the flame. When the throttling jet is large enough to supply adequate fuel (about 2gm/minute) and small enough to limit the backflow of fuel, the stove operates well. Starting and regulating the power level entails raising or lowering the tank with a string. More height = more pressure on the system and the power (heat output) increases. The REDI stove can be extinguished by lowering the tank below the jet at which time the fuel stops spraying out. It is a simple, safer and relatively easily operated stove. Its drawbacks were the pulsing which tended to put out the flame if you tried to rush the starting sequence, similar CO levels compared with the other products on the market and the cost of the combustion and pre-heating components. 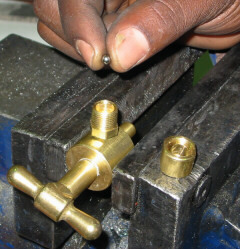 It is not very easy to make in a small workshop, even though there are units being produced in 10 or more countries. The cost of production was eventually reduced to $7.50 which is more than the common wick-type stove but it has a longer life and is more stable. If it is tipped over the flame can continue for a long time and can spray a large flame as fuel rushes into the hot, tipped-over pre-heater. It cannot explode which is a major advance in safety. The FSP stove also has an external tank. It has 'roarer' components in that it has a pre-heater and a gas jet, but there the similarities stop. The FSP stove has significant differences which improve the performance markedly. The first thing you will notice is that it has a brass fuel control valve. This means the fuel tank can be mounted permanently in the house if so desired. The stove can be operated by a child without handling the fuel container at all. The technically inclined will also notice immediately that the pre-heater tube is not a welded or brazed component - it is simply an 8mm tube bent carefully into a 300 degree arc at the top and a loop to the bottom where the jet is mounted. The eliminates almost all of the difficulties in fabrication, significantly reducing the cost and the risk of a faulty welded joint in the tubing. 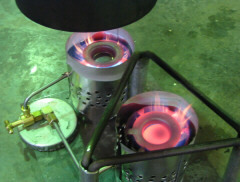 The entire stove can be fabricated without any welding at all. It can be made in a refugee camp, for example, without any need for electricity or gas. Inside the control valve is a non-return valve that prevents pulsing altogether. There is a small steel ball taken from a bicycle bearing sitting in the upper side of the control valve just below the entrance of the steel pipe. In order to function correctly with no additional parts, the pipe must be connected to the top of the control valve. Thus the ball sits at the bottom of the fitting blocking the in-feed hole. Incoming fuel lifts it a little but it seals if the fuel tries to flow backwards. The pipe proceeds gently upwards to the burner so that it automatically removes air bubbles coming through the fuel line. The gas jet is 0.60mm in diameter with an 8mm hex head and an M6 standard metric thread. The pre-heater tube and jet are set inside a surrounding tube in which the combustion takes place. That is in turn surrounded by a thin tube that acts as an air pre-heater. There is a stainless steel saucer-shaped ignitor plate suspended above the jet. This serves to ignite the sprayed fuel once it is hot. If the ignitor plate is removed, the flame cannot be maintained. The ignitor plate is sitting loosely in the stove so that if it is tipped over, the plate falls out and the flame goes out immediately. Some paraffin stoves are available immediately. Parts for the FSP stove and sample stoves are available for sale. FSP Stoves have very low carbon-monoxide emissions (less than 0.1% of CO2 values). They burn between one quarter and one half as much fuel as wick-type stoves. It is expected that the stove will sell (in different forms) for between $5 and $25. 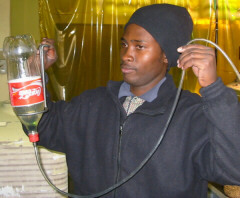 They are also available in assembled form through trainees near Free State Technikon in Bloemfontein. Please contact us for more information. The purpose of this test was to evaluate the efficiency of the stove when a plate is set under the pot to prevent the hot gases travelling downwards and away from the pot as is the case with open framework stoves with a central burner. I took a standard REDI stove frame and tank and added a larger combustion chamber (made of thin sheet metal) about 100mm in diameter. This was to get more air mixed into the fuel. I placed on it a stainless steel bathtub plug receptacle (76mm dia but no holes in the bottom) to act as an ignitor. Around the outside I placed a perforated thin sheet tube 130mm in diameter with a total (8mm dia holes) hole area 20% larger than the difference between the inner combustion area and the ignitor. The holes are clustered towards the center of the height in 5 rows. I placed a flat sheet under the bottom to seal off the air thus preventing a direct updraft through the stove body and forcing the incoming air to pass through the holes in the outer cylinder. This has the effect of preheating the primary and secondary air. The outer cylinder is about 30mm taller than the inner cylinder. On top of the 6mm round bar framework of the REDI stove I placed a top deck from a Vesto with three feet about 18mm high to keep the pot up off the deck. The outer cylinder (above) hangs in the top deck suspended by a top lip. Around the outside I dropped a standard Vesto heat shield which is 95mm high and 286mm in diameter. The jet was a 1.0mm jet with 4 wires taken from a wire brush pushed through so as to reduce the effective size. I would have preferred a smaller jet but they are all gone at the moment. The spray pattern was lousy and the flame was not all blue, however the combustion efficiency was so good, as the results below show, that the test went ahead. The specific fuel consumption was 4.39cc/min for a rating of 2.44 KW. One litre will be consumed in 3 hours 48 minutes. The fuel pressure was 1.05 metres (the tank is elevated above the stove). When the stove was running and the flame stabilized I placed the pot on the pot supports. The side gap between the pot and the heat shield was about 16mm. First I lit the stove having weighed the fuel, the pot, the water in it and recorded the water temperature. Then I took a number of gas and physical measurements over a 27 minute period. The pot boiled in 14.5 minutes after which I had to take off the lid because it was boiling so vigorously. Permissible limit for CO/CO2 ratio = 2.00%. Total Time: 27 minutes from placing the pot on the stove to weighing it after the test. The heat absorbed by the pot and lid was not taken into consideration. Some of the discrepancy between these two figures can be explained by the pot absorbing heat during the water heating phase. 1. There is significant heat transfer efficiency to be gained by trapping the hot gases between a reflective plate and the underside of the pot, and incorporating a heat shield or "shroud" around the pot. 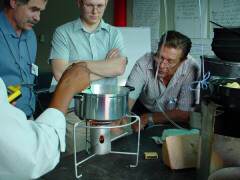 The heat transfer efficiency of the open frame pressure-type paraffin stove as tested at SABS in Pretoria is about 40%. The top is open and has no shrouding. 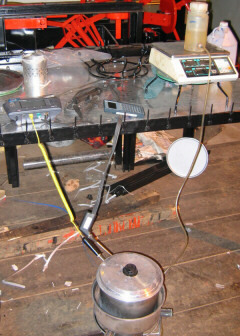 This experiment indicates the level of fuel economy that can be had for a small investment in sheet metal. 2. The REDI stove is well suited to adaption to the FSP Stove layout and acoutrements (fuel control valve, non-return valve in the fuel line, loose ignitor plate and preheated primary and secondary air). 3. The absence of a perfect, steady, intense blue flame does not mean that the emissions are necessarily high. 4. 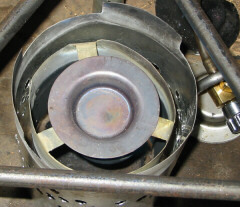 The provision of a small chamber under the pot and above the ignitor plate seems to complete the combustion process even when it is obvious that the combustion has not been completed under the ignitor place as is normal with an FSP stove. The operating temperature of the components was significantly lower than in a well made FSP stove. The heat transfer efficiency may have been reduced by this, however. 5. Interfering with the paraffin gas spray pattern does not necessarily increase the CO emissions when the stove body is as described above. This is unexpected and contradicts earlier experiences. 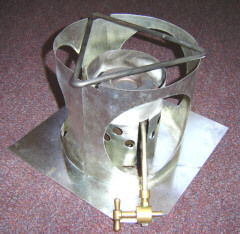 A 3 Kilowatt FSP stove made by Ludrick Barnard. It can boil 1.7 litres of cold water in 7 minutes. This picture will be released after the 5th of November 2004. The smooth operation of the FSP stove is facilitated by the use of a small ball-check valve at the exit of the control valve. The fuel tank can be as simple as a 2 litre bottle hanging in a metal bar frame. The system is modular so that at any time the owner can upgrade to a second burner and attach it with a tube to the same supply tank. A two-burner FSP stove has two control valves. The essential parts of an FSP stove are shown here: valve, pipe, air pre-heater, combustion chamber, ignitor plate and a pot support. 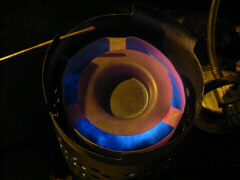 A night picture of a 2 Kilowatt FSP stove as seen in the movie. Testing a 2.4 Kilowatt modified REDI stove with FSP Stove brass components and Vesto sheet metal body parts. See the test report. 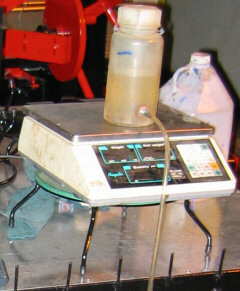 Note the pot, the heat shield (shroud), the thermometer with the yellow wire, the emissions sampling probe and the plastic fuel line from the elevated tank. 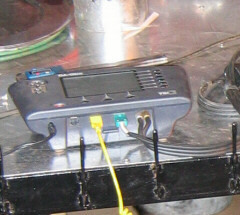 A TSI combustion analyser. The connections are, from left to right, power supply, water temperature, gas sample temperature, draft sensor, gas sampling pipe. 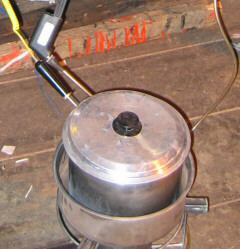 The fuel supply is connected to the stove with an 6.25mm plastic pipe. A wide variety of containers can be used including 2-litre soft drink bottles. The container is sitting on an electronic scale (2 gm sensitivity). The scale is sitting on a Vesto Stove stand to keep it about 1 metre higher than the stove. This pressure is the force behind the fuel spray from the jet at the base of this REDI-FSP stove. The coiled black pipe is the gas sampling tube. You can also see the in-line water trap and particle filter. The HP 48G calculator is being used as a paper weight to prevent the sampling tube from falling into the gap between the pot and the heat shield. General view of the test setup. Below, the original REDI stove. Left to right, Crispin Pemberton-Pigott, Grant Ballard-Tremeer and Werner Schultz. Photo by Christa Roth, 2003.